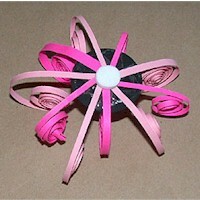 Use these colorful, whimsical Quilled Gift Package Ornaments instead of bows when wrapping packages. They are easy enough to make that even children can manage it. 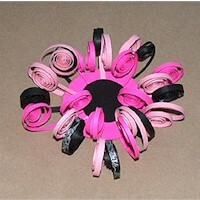 Photo 1 shows the paper supplies needed to make this pink and black package ornament. 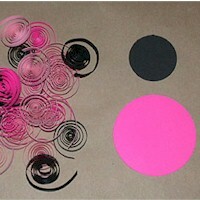 You can substitute any of the colors to meet your needs. 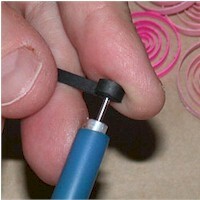 Roll your quilling strips by inserting the end of a paper strip in the slit on the tool. Start to turn the tool so the paper coils around it. Use your fingers to maintain even tension while rolling the paper strip, in order to get an even coil. When you reach the end, give the tool a slight 1/4 turn in the opposite direction to loosen it and gently ease the coil off the tool. Cover the back of the smaller circle with double sided tape (you don't have to be too precise or neat, it will not be seen in the finished product. 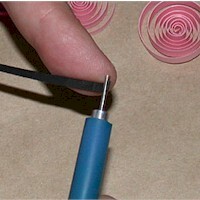 Begin gluing down strips of paper around the circle as shown in the photo. Finish attaching the strips all the way around the smaller circle. 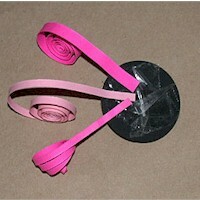 Add more tape to the back of the circle as needed to firmly hold the strips in place. Attach a pop dot (if you want dimension) or more double sided tape (if you prepare a flatter ornament) to the center of the circle. Turn the ornament over and adhere it to the center of the larger paper circle. If you like the way the ornament looks, you can stop here. 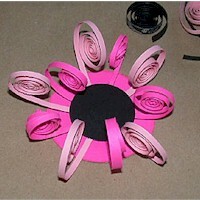 Or, you can go on to Step 7 and add another layer of paper coils.